Continuing a Christmastime tradition, 4 Wheel Parts stores throughout North America are conducting Toys for Tots collections to aid less fortunate children. 52 of the 60 locations in the U.S. are participating to distribute unwrapped toys to kids with drop offs inside stores. 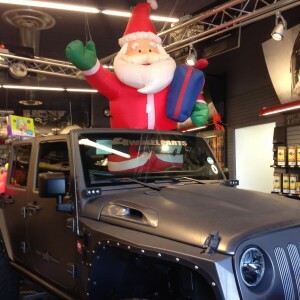 Toys can be truck and Jeep gifts related to off-roading or anything else children would enjoy. “Our goal is to make kids happy with new toys, and to make it easy for our customers to contribute toys through an easy and quick drop off site,” says Laura Hansen, 4 Wheel Parts Marketing Assistant. Loyal 4 Wheel Parts customers have dropped off toys like puzzles, dolls, games and Hot Wheels to be distributed. Customers can contact their local 4 Wheel Parts store by calling or stopping by for more information and drop off deadlines. The Toys for Tots program was launched by the U.S. Marine Corps nearly 20 years ago with a mission to dispense unwrapped toys to less fortunate children.